"My art is built on, and held together by, traditional Torres Strait designs, based on legends of the past." Alick Tipoti was born in 1975 on Thursday Island in the Torres Strait. He has completed an Associate Diploma of Aboriginal and Torres Strait Islander Art at Tropical North Queensland Institute of TAFE. Tipoti has also received a Bachelor of Visual Art (Printmaking) from the Canberra Institute of Art, Australian National University. 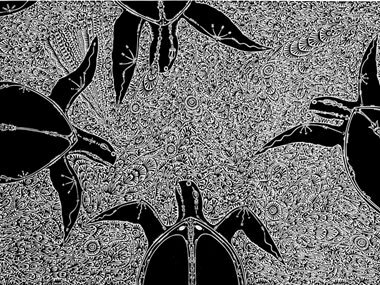 In 1998 Tipoti was awarded the Lin Onus Youth Prize in the fourth National Indigenous Heritage Art Awards for his lino print, Aralpaia ar Zenikula.